The building is open since September 2004, located in the villa district od Poznan guaranteees silence and also quick access to the city centre (about 10 min.). 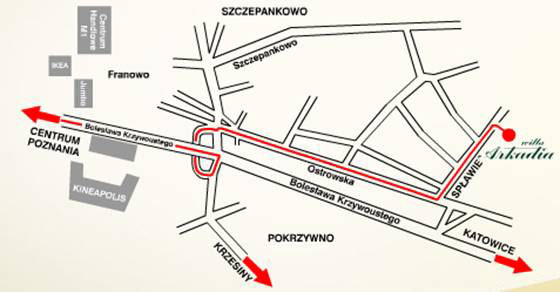 The Pension is easy to reach because of nearby highway A2 and Katowice express road. We guarantee nice and friendly atmosphere. The hotel is situated 10 km away from the city center. The nearest railway station is 10 km away from the hotel and the bus station is 9 km away from the hotel. The airport is 25 km away.